There's a tonne of weapons included in Dying Light, around 120 in total. These range from knives and larger blades to bats, bars and even guns. Weapons can degrade and must be repaired before they eventually get destroyed. Players can also upgrade their weapons (like a mod) to create a superior weapon type and even add elemental damage to cause additional damage dealing effects. Stronger weapons are encountered later in the game as you progress away from the Slum towards the other areas of the map. Increasing your Survivor Rank will unlock better weapons at the Vendors giving you a better chance of buying stronger weapons such as guns. Weapons are colour coded to determine their quality ranging from Orange, Purple, Blue and Green. The better weapons are orange whilst the more common types are green. The Orange weapons have the best stats and also the most upgrade options available. Damage - the damage the weapon can inflict. Durability - how many times the weapon can be used, before it's destroyed. Handling - the speed of the weapon. Repairs - how many times you can repair the weapon. Upgrades - the number of available upgrades for this weapon. Knives are very light and very fast. They don't deliver as much damage on a single hit but you can inflict several hits in a short space of time. Agile players will prefer to use the knife to stay mobile and move in and out for kills. The downside of knives is that it's easy to get overrun by groups of zombies if you don't finish them off quickly. One handed weapons are fast to swing and they keep you mobile. The downside is that they only inflict a limited amount of damage compared to their two handed counterparts. They can be charged but cannot be used for special moves such as the Windmill. Two handed weapons are heavy melee weapons. Most of these have longer swing animations than one handed weapons but the damage they inflict is much greater. These weapon types have a major advantage over the smaller melee weapons in that you can use the charged attack to inflict a serious assault against zombies (perk must be unlocked first though). An example of a two handed weapon is the Baseball Bat. Although it's a two handed weapon, it's lighter than the others and can be swung faster while still inflicting a deadly blow. 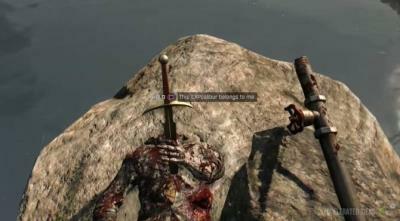 All melee weapons suffer from durability limitations, just like in Dead Island. The more you use a weapon the more the durability decreases. A weapons durability is shown in the top left corner of the screen. When a weapons durability gets low it'll do less damage and you'll need to repair it to keep it going. A message will appear on screen saying "Weapon Ineffective". Eventually the weapon will break and you'll have to replace it with an alternative. To repair a weapon you'll need the materials (such as little metal pieces) to keep your favourite weapon going. These are commonly found scattered around the map. Weapons can only be repaired a certain number of times, determined by their Repair stat in the inventory screen. Elemental weapons are alot of fun because they inflict elemental damage to the infected. We know that weapons can be upgraded in different ways and the most interesting of these upgrades are: Fire, Ice and Electricity damage types. These elemental modifications cause insane damage to zombies. See this post for a full list of Blueprints (mods). Some can be acquired through side quests whilst others a freely located around the map. Weapons are modified using collectable materials that you'll find around the map. Players don't need a crafting bench to craft new mods so long as they have the desired skill or blueprint. A good example of a modified weapon is the sledgehammer that's modified with the Electricity elemental mod. 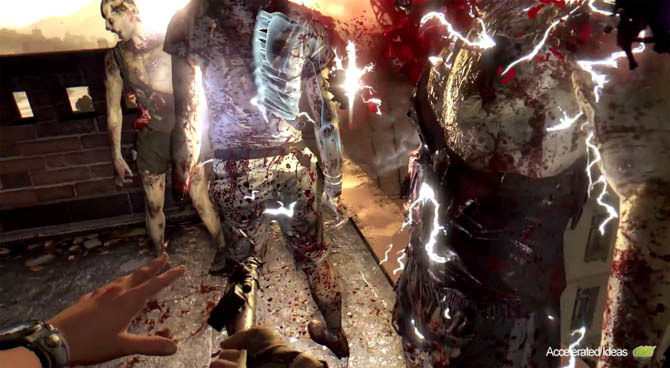 Successfully hitting a zombie with this modded weapon will cause an electric chain effect, with damage passing between zombies in close proximity. Any combustible materials will also ignite in the area causing a nearby blast or small fire. The Fire mod will make zombies combust upon impact and it has the same chain effect as electricity - fire damage will slowly spread between zombies in close proximity causing AoE damage and also damage over time. The Ice damage type freezes zombies in their tracks, giving you ample time to kill them off. A good example is the Shield defensive weapon which can be modded to include Ice damage, providing the perfect block, freeze and counter attack combo for your character. Guns are very rare in Dying Light but once you acquire them you're going to have a huge advantage over the enemy. It's important to realize that although guns make light work of zombies, the noise they create will increase your detection level thus attracting more zombies to the nearby area. To balance the game, Techland placed a restriction on the amount of ammo you can carry and also the amount of ammo you can find. Therefore, use your gun ammo wisely for those quests or situations where there's no other choice. Later in the game, you'll come across certain zombies that also use guns against you. Once you reach this stage, it's incredibly difficult to run past zombies without engaging in a firefight so avoid hip fire and go for pinpoint accuracy to make the most of your firepower and ammunition. Pistol - high ammo, low impact, but still more effective than melee. Shotgun - high powered, capable of taking off the heads of zombies. Assault Rifle - more effective at medium range. Shields provide protection against zombie attacks, while still giving you the chance to use a primary melee weapon as a counter attack. Shields can also be used as offensive weapons when combined with elemental damage. For example, combining the shield with elemental ice will freeze zombies that get stunned by the shield. The shield skill must be unlocked first before you can use shields to your advantage. You can increase the attributes of weapons using Upgrades for Damage, Durability or Handling. You obtain upgrades by helping other survivors in encounters or while exploring. If you would like to see the full list of mods and blueprints read the crafting guide. Assassin - increases the handling speed for weapons.You swing faster and use less stamina. Home-run - adds an electrical charge to the baseball bat, sending zombies flying. Industrial-Grade Leech - adds bleeding to any melee weapon.